Hey, gals! How are you dressing up (or down) this year on Thanksgiving? I am planning on celebrating the holiday with my best friends over at her house. My best friend and her Dad are great at cooking and I know they are going to serve up something delicious. 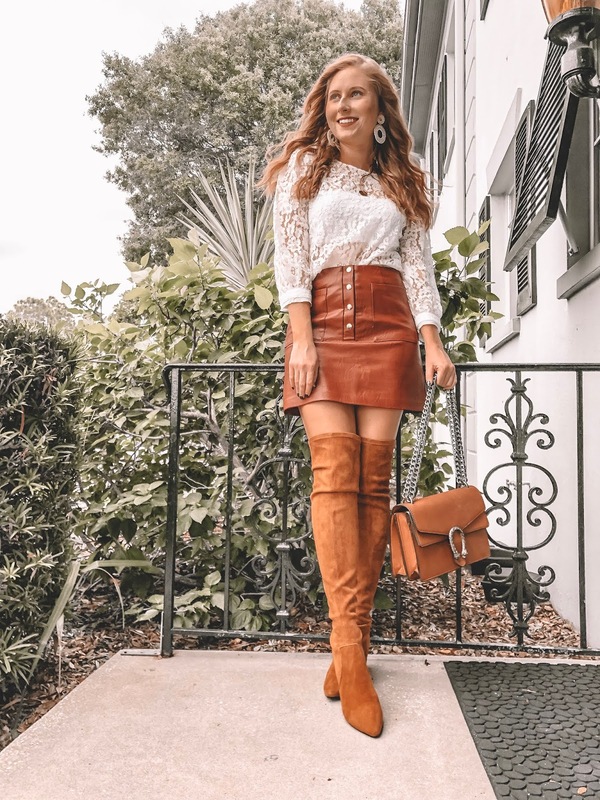 As for what to wear, I am thinking about putting on a pretty velvet dress or wearing a faux leather skirt + boots combo, similar to the one pictured in this post. Now that we've had a little cool down in St. Pete, I can finally get some more use out of my favorite tan boots from Goodnight Macaroon. At first, I was extremely hesitant to purchase these boots. The price was out of my range! I normally allow myself to buy 2-3 new pairs of boots per fall season and these were going to be the most expensive pair to buy. I am lucky I bought them in time to style them all around town and over on my Instagram page. These boots from Goodnight Macaroon were a great item to buy for myself because I've worn them numerous times already! I even brought them with me on my last trip to Austin. 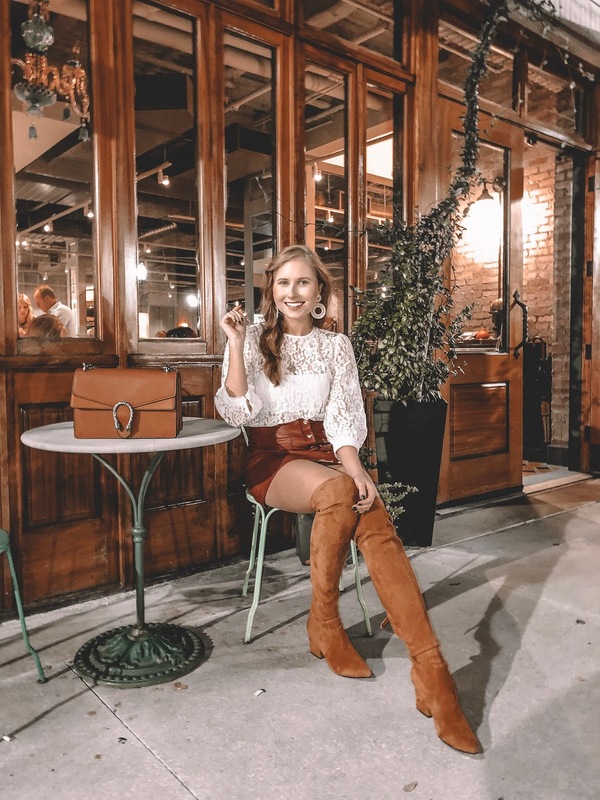 These boots are the "Marlo" Tan Over the Knee Suede Leather Boots. I ordered mine in a 10.5 because I was told to go up a half size when ordering these boots. The 10.5 fits me perfectly! I normally wear a 9.5/10 in most shoes. Use the code "GMJOY30" to receive an extra 30% your order, too. More about these boots -- they stay up on while you walk, too! I've had numerous requests asking if these boots stay up while you walk and the answer is yes. That's yet another reason why I can't stop wearing them over jeans or with a mini skirt. These tan over the knee boots are actually convincing me to make another purchase and get myself the grey pair, too! Now that I know my size I can confidently order another pair in the future. I am eagerly anticipating the holiday next week! Thanksgiving and Christmas are two of the best holidays to celebrate with friends and family. I am also hosting a fun event today at PAINT Nail Salon in St. Petersburg with some Tampa blogger babes! I am excited to get a fresh manicure and chat with my friends while we hang out at the all-natural fume-free nail salon, too.